Event tickets are scheduled to go on sale today (Feb. 2) for the seventh annual Ohana: Luau at the Lake at The Tiki Resort in Lake George, N.Y. 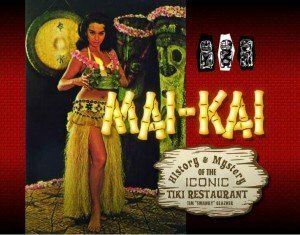 Featuring three days of music, cocktails and ‘ohana in a classic Polynesian setting, the June 25-28 event has become the biggest Tiki gathering in the Northeast and one of the signature events of the Fraternal Order of Moai. The 1950s era Polynesian-themed motor inn will be transformed into a weekend Tiki party featuring carvers, artists and vendors plus room parties and an authentic luau. 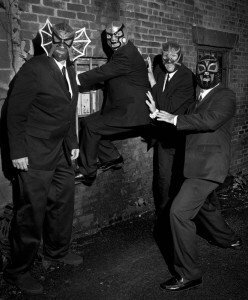 Last week, it was announced that Los Straitjackets, the Lucha Libre-masked surf-rock stalwarts, will be headlining this year’s entertainment lineup. Other bands scheduled to perform include The Neanderthals, Waitiki, The Outta Sites and 9th Wave. Keep an eye on the Facebook page for further updates. Just days remain in the Kickstarter campaign to launch a board game that pays homage to 1950s and ’60s cocktail culture. Play Swinging Jivecat Voodoo Lounge and you can also sample 54 tasty cocktail recipes, which are included in a spiral-bound book. The Kickstarter page includes videos, artwork and design, plus full details on the game. The campaign ends at 7 p.m. Thursday, so don’t hesitate to help out. 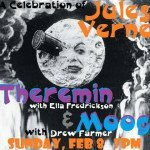 Joining forces for one of the most creative events we’ve seen in a long time, Drew Farmer of Tampa’s Stolen Idols (the band of the week in our first Week in Tiki) and Ella Fredrickson of the Florida Orchestra will perform on their respective quirky instruments in honor of Jules Verne’s birthday next Sunday, Feb. 8. The Mermaid Tavern in Tampa has likely never seen the likes of dueling Moog synthesizer (Farmer) and theremin (Fredrickson). The eerie sounds emanating from these exotic instruments are a fitting tribute to Verne, the 19th century French novelist considered to be the godfather of sci-fi . The oscillating begins at 7 p.m. Check out the Facebook event. The Tiki festival season officially kicks off in May with Tiki Caliente in Palm Springs, Calif. General room and wristband sales are under way for the intimate May 14-17 event, which is limited to 450 attendees. Featuring music, art, vendors, room parties and more in a mid-century modern setting, the seventh Tiki Caliente will be held at the historic Caliente Tropics Hotel, site of the first two events in 2008 and 2010. Rooms at the 50-year-old landmark are unfortunately already sold out, but several neighboring hotels began offering special room packages last week. Also announced was this year’s event mug, created by Doug Horne and manufactured by Eekum Bookum. It will be limited to 200 pieces, available for pick-up at the event only. The design pays tribute to the Caliente Tropics 50th anniversary as well as Tiki Caliente’s history in Palm Springs. Live music will include the Jimmy Psycho Experiment, Troy Fernandez, the Martini Kings, Smokin’ Menehunes, Ding Dong Devils, The Lampshades, and Tiki Joes Ocean. Click here to order mugs, wristbands, and hotel packages. 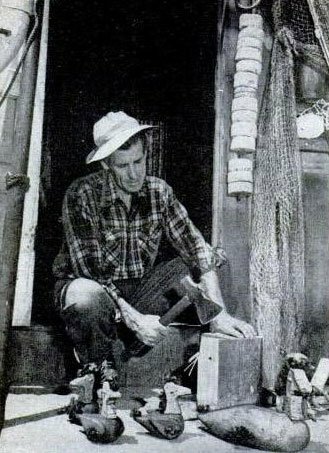 Eli Hedley at his beach home that he built out of driftwood and other flotsam and jetsam. Settling on the California coast with his wife and children during the Great Depression, Eli Hedley (1903-1981) became “the original Beachcomber” out of necessity. He and his family built their house out of driftwood, decorating it with shells, glass and nautical gear. Hedley’s craftsmanship in creating a nautical South Seas environment thrust him into the booming Polynesian Pop craze of the mid century. His influential beachcomber aesthetic became so much in demand, he created the successful Tradewinds Trading Company and went on to decorate hotels, restaurants, apartments, celebrity homes, even Disneyland. He set up shop in Adventureland, selling hand-carved Tikis from own store. One of his more famous works was the massive moai at the Stardust’s Aku Aku in Las Vegas. Hedley’s grandson, Bamboo Ben, has followed in his footsteps with a career designing furniture and interiors for Tiki bars and restaurants around the world. 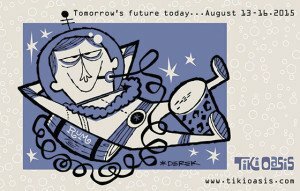 For those of you who like your Tiki infused with Disney (or your Disney infused with Tiki), the blog written by art director, illustrator, writer, show designer and sculptor Kevin Kidney is right up your alley. Acclaimed for their work on parades and merchandise for the Disney parks, Kidney and partner Jody Daily are on the cutting edge of all things retro. The blog has an artist’s sensibility with its detailed features and great eye candy. Kidney’s insights into the world of Disney are particularly fascinating. Catch Kevin and Jody at The Hukilau in Fort Lauderdale in June as they present a symposium titled “Prefeb Paradise,” exploring the origins of and design of Walt Disney World’s Polynesian Village Resort. Tickets are on sale now. What do acclaimed ’70s-’80s new-wave rockers do for an encore? Form an exotica band, of course. Elliot Easton, perhaps best known as lead guitarist for The Cars, pursues his passion for a smorgasbord of retro styles with his group that also includes an all-star cast of Nicky Walusko on guitar, Todd Jaeger on keyboards and theremin, and Chris Reccardi on bass. 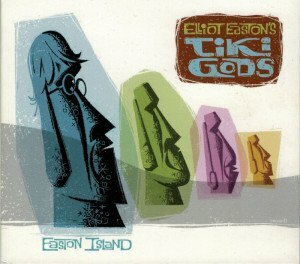 The group’s debut album, Easton Island (2013), touches on everything from spy and crime jazz, to surf, to lounge and space age. But it remains an exotica release at its core, held together by the impeccable musicianship and production values one would expect from this ensemble. Standout tracks include Rarotonga, Sir Surfalot, Sabotagia (I Say Sabotage), and Ballad of Cowboyaredee. 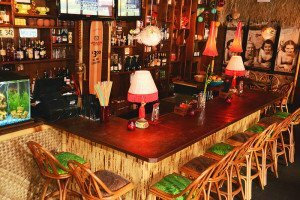 Named after the legendary bar and restaurant at the Stardust Casino in Las Vegas (1960-1980), the new Aku Aku is a more modest yet no less authentic Tiki bar in another tourist mecca, Orlando, Fla. The name makes perfect sense when you notice that the small bar, which opened last January near Lake Eola in the city’s downtown Thornton Park district, shares a building and ownership with the mid-century-themed Stardust Lounge. It even features a similar (albeit smaller) moai head standing guard outside. 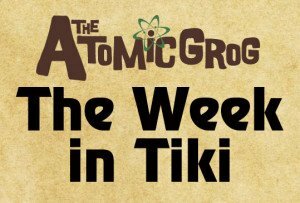 There’s a ton of authentic Poly Pop decor, including carvings and Tikis by Tampa’s Jeff Chouinard (our first artist of the week). The lighting is appropriately dim and the music is usually vintage exotica. On the menu, you’ll find a dozen signature tropical drinks in the appropriate mugs and glassware (Aku Aku, Mai Tai, Zombie, Hurricane, etc.) and an impressive collection of 70 rums. Aku Aku is open seven days a week. Check the website for daily specials. 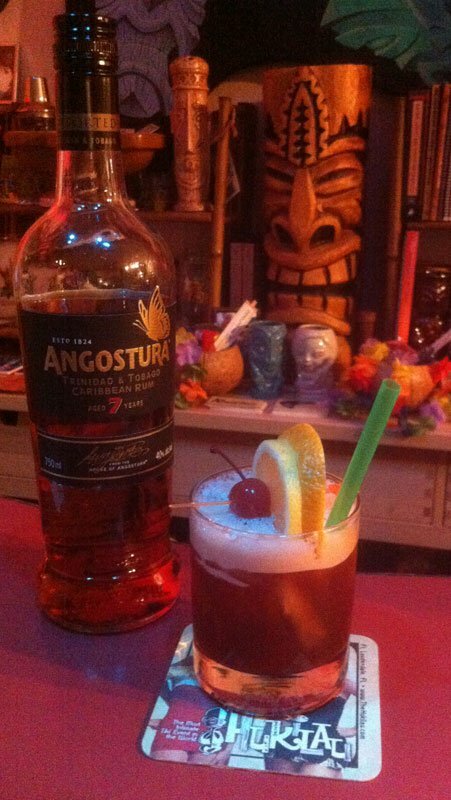 Though more well-known for its iconic Aromatic Bitters, the House of Angostura in Trinidad and Tobago also distills and exports a fine assortment of aged rums. The 7-year-old rum is a blend of light, medium and heavy rums, aged in Bourbon oak casks. It’s a complex rum, both sweet and dry, with a deep spiciness and hints of cinnamon. It’s loaded with subtle bakery flavors like vanilla, chocolate, molasses, honey and coffee. Yet it’s straight-forward enough to be a great mixer, an ideal gold rum to jazz up Tiki cocktails. Shake with ice cubes and pour into a double old-fashioned glass. Garnish with a cherry speared to lemon and orange wheels. Delaney, winner of the 2012 Angostura Bitters Global Cocktail Challenge, came up with an improved version of this 1970s-era cocktail. The bitter Campari and molasses give it a distinctive edge, blending nicely with the juices and accenting the rum. It’s not cloyingly sweet like the original can be. There are various molasses syrup recipes, but my favorite is this one from Martin Cate of Smuggler’s Cove. The Jungle Bird was created in Malaysia in the late 1970s, the waning years of the Tiki boom. But it seems to have gained a new appreciation recently in craft cocktail circles (see this New York Times story). 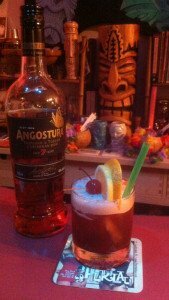 The vintage recipe published in Beachbum Berry’s Intoxica and Remixed calls for 4 ounces of pineapple juice, standard sugar syrup, and dark Jamaican rum. I was introduced to Delaney’s version at The Hukilau in June 2013, when the brand ambassador mixed up two of his signature drinks. I was highly impressed by Delaney, both cocktails, and all the rums that were being sampled. This entry was posted in Art, Cocktails, Culture, Events, Events, History, Music, Other Florida, Recipes, Rum, South Florida, The Week in Tiki and tagged Aku Aku, Angostura, Angostura rum, Eli Hedley, Elliot Easton's Tiki Gods, Jody Daily, Jules Verne, Jungle Bird, Kevin Kidney, Ohana: Luau at the Lake, Stolen Idols, Tiki Caliente. Bookmark the permalink.